Thank you for your kind invitation. It is a great honor for me to be here today representing France and the Military Mission at the French Embassy in Washington DC. As a French military Reserve Officer, I am proud to be in front of you on these historic and sacred grounds. 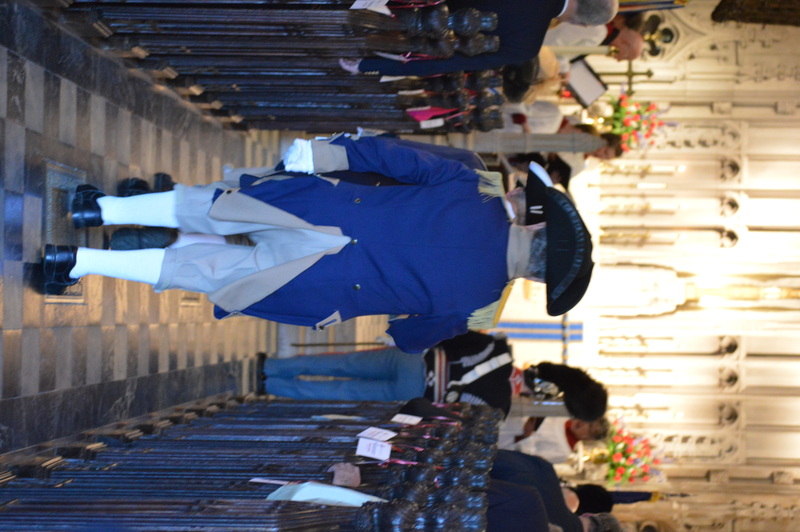 I am also very humbled to be commemorating with you 236 years of friendship between France and the United States and to remember the men who fought for Liberty side by side, French and Americans. 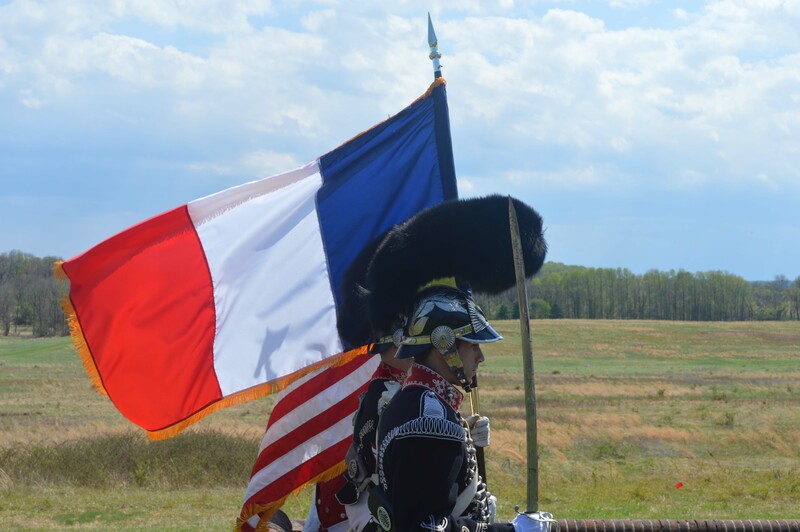 I am currently commanding the French Army Reserves in the United States, a unit dedicated to working closely with our American friends and facilitating the relations between our two armies. 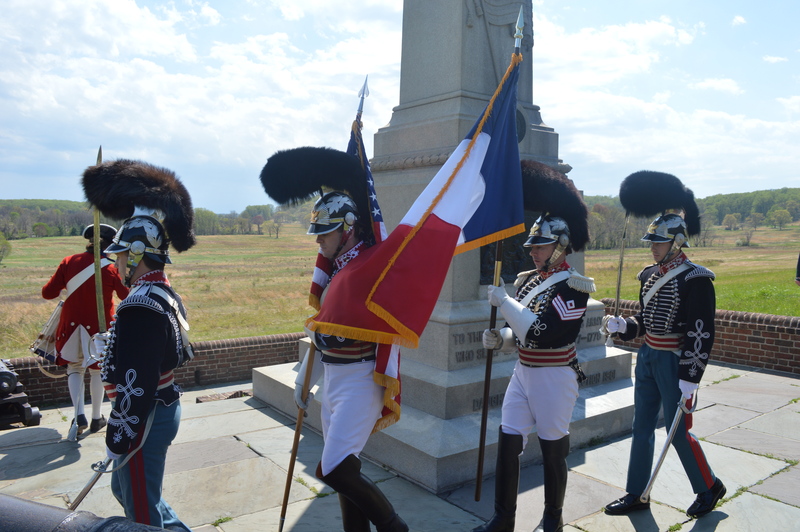 We are French Liaison Officers in the United States and we have a wide range of missions. As you can see the spirit of support and friendship born in 1778 remains unchanged and is as strong as ever in 2015. Our politicians may not always agree on all issues but Americans and French do share the same vision of freedom and liberty. Today’s commemoration also reminds us of our roots and our values. The United States and France would not be the countries they are today without each other’s support throughout history and our friendship is deeply rooted. It stands the test of time. 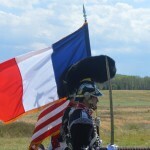 Today we remember the French officers and their men who fought during the American Revolutionary War: Lafayette, d’Estaing, Rochambeau, Du Portail, de Grasse, de Ternay, Saint Simon, Vernier, Florimond Langlois, Gouvions, Tronson de Coudray and countless others…. 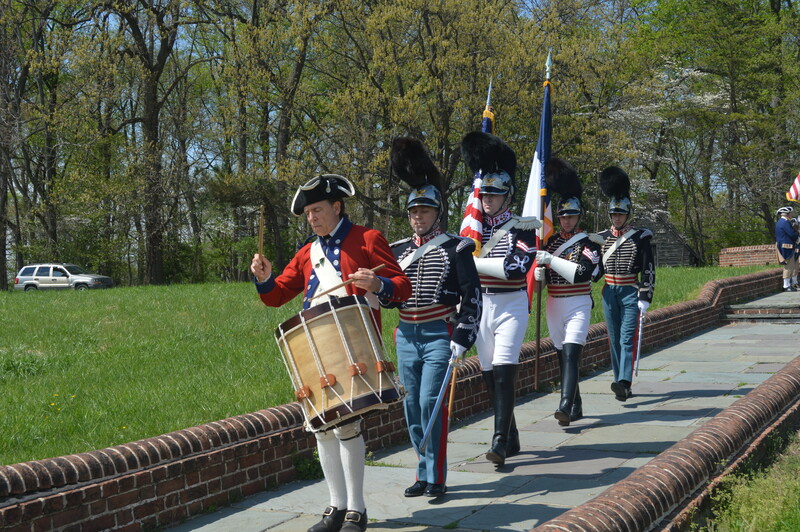 The French servicemen who fought for the US Independence, included 8,000 French Soldiers, and 28,000 Sailors, all were instrumental to the final victory at Yorktown. 5,000 French soldiers lost their lives throughout the war for Independence and countless more were injured. In relation to the size of the French population at the time, this was a very high number of casualties. Please be assured this same spirit of memory is very much alive in France and the respect is mutual. Commemorations in honor of the American soldiers who gave their lives for my country during the last world wars are numerous and never forgotten. 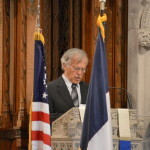 I am also, with Patrick du Tertre, Paul Bensabat and Jean-Pierre Heim the Co-President and Co-Founder of “The French Will Never Forget”, a non for profit association dedicated to demonstrating the love and gratitude of the French people for the decisive help of America in the past century. 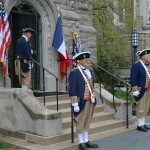 After having organized many events commemorating the sacrifice made by the Americans for France, I am extremely moved to be commemorating with you today the sacrifice made by the French for America. In 2003, in 11 cemeteries throughout France, we laid a red rose on each and every one of the 60511 graves of US soldiers fallen during WWII for our freedom. Today we are honored with the presence of Mr. Alvan Markle III who was recently installed as a “Chevalier of the Legion of Honneur”, France’s highest distinction. A veteran of the Second World War, Mr. Markle was a 2nd Lieutenant in the 266th Field Artillery Battalion of the First Army. He and his unit landed at Omaha beach and fought through France, participating in the liberation of Paris and the Battle of the Bulge and then into Germany. Sir, my country and I thank you for your service. In 2011 we organized in Paris the largest commemoration of the tenth anniversary of 9/11 outside the US. We raised two eighty foot high towers replicating the World Trade Center and positioned them on the Trocadero Plaza in front of the Eiffel Tower. On June 6 2014, we commemorated the 70th anniversary of D-DAY by organizing a ceremony on Liberty Island in front of the Statue of Liberty. In the presence of a US color guard representing all 5 services and of a French color guard staffed by sailors of the French Navy frigate aptly named “Lafayette”, our two gigantic French and American flags were deployed at the feet of the Statue of Liberty by young children of French American schools in front of thousands of French and American participants. National anthems were played, a 21 gun salute performed and a dozen veterans of D-DAY were honored. But the key event was when over one million rose petals were dropped by 3 helicopters onto the Statue of Liberty. I assure you it was spectacular. From below the statue appeared wrapped in a maze of red flowers. I understand Mr. Pearson has made arrangements for you to see the movie later on today,. Our two countries enjoy a very long-lasting friendship, and today’s celebration is one more proof that no one will ever forget the courage and heroism of our soldiers on both sides of the Atlantic. 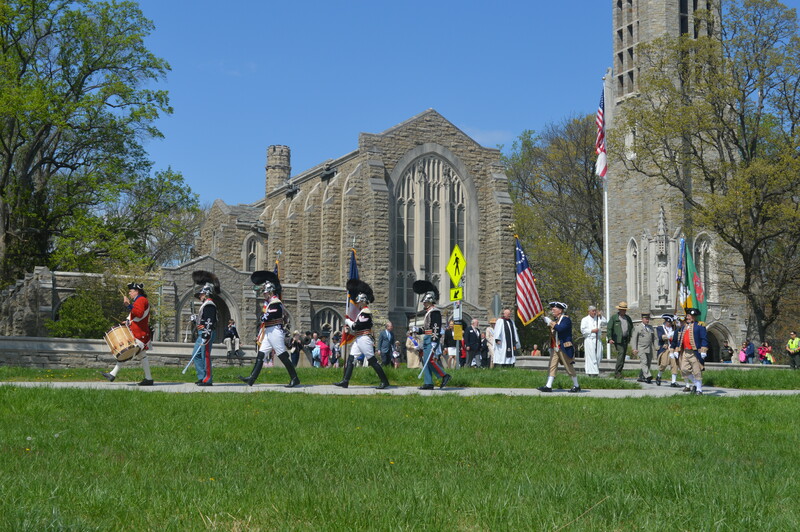 YOU too are carrying on the tradition and are keeping the flame of remembrance and friendship alive for 236 years. I thank you on behalf of my country. To conclude, I would like to thank Mr. Gardiner Pearson for his kind invitation and his support in preparing this important commemoration and to recognize the historic First Troop, Philadelphia City Cavalry for escorting us today. Gentlemen, it is truly an honor. Thank you, God Bless America and France and the French American friendship forever.